The reason that many product labels are so difficult to read is that manufacturers are often balancing the need to include required information on the product label with a lack of sufficient real estate on which to print the required information. Many products, and particularly drug products, are packaged in relatively small containers, which limits the size of label that can be used. Thus, in order to provide all required information, the manufacturer is often left with no option but to use very small text which is crowded and often difficult or impossible for most people to read without some form of vision aid. The 2013 guidance for prescription drugs recommends that at least a 12-point font size is used whenever label size permits and that a font is chosen that is easy to read, not light-weight or condensed. Since it is often not possible to fit this size of print in the available space the FDA Guidance also encourages manufacturers to explore unique packaging approaches to address this issue. We believe that IC Optix magnifier label technology provides a unique packaging approach to the problem of label legibility that will improve consumer/patient compliance and safety by reducing the chance of medical error. 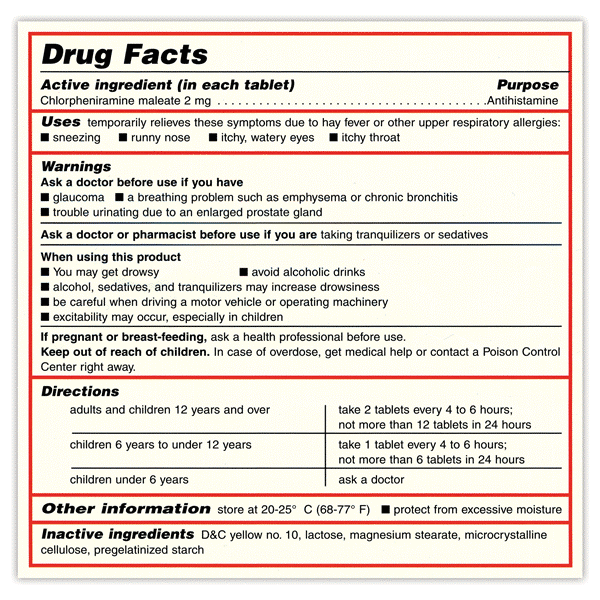 The 2008 guidance for OTC products recommends at least an 8-pt font be used for Drug Facts and a 6-pt font for subheadings. This size of text is not legible to most of the population without the use of a vision aid. It is very common to see the following type of label on OTC products – most people can’t read this very important box without a vision aid! The examples shown below illustrate the magnifier label as it would appear on a product prior to use (left) and during use (right) after peeling and lifting above the surface of the label. By adjusting the distance of the lens from the surface of the label the text can be magnified to a greater or lesser degree. The magnifier technology can be readily integrated into the conventional label manufacturing process to be a surface peel layer of the primary product label. Alternatively, the magnifier technology can be integrated into a completely transparent label that can be used to over label the existing primary product label.